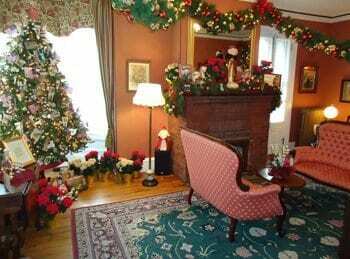 The Queen Victoria is always open and the Cape May Christmas holidays is one of our favorite “seasons”. The festivities start at Thanksgiving and continue through the New Year. The Queen Victoria buildings are adorned with the most exquisite Christmas decorations & lights. Our luxury Inn is one of the most photographed buildings during the holiday season. You have to see it to fully appreciate it. There is nothing I can give you which you have not, but there is much, that while I cannot give, you can take. No heaven can come to us unless our hearts find rest in it today. The bloom of the world is but a shadow, behind it, yet within our reach, is joy. And so at this Christmas time, I greet you with the prayer that for you, now and forever, the day breaks and the shadows flee away! With the largest collection of Victorian frame buildings in the United States, historic Cape May seems a perfect spot to recall holidays past. The following article was printed in House Beautiful’s Home Decorating, Winter 1985, 86. We have updated it for you with the comments in italics. Like the early German Christmas trees, the early Victorian ones were ornamented with little more than nuts, fruits, buds, pretzels and decorated eggs, all of which harkened back to pagan fertility symbols associated with festivals celebrating the coming of the winter solstice. This was just what the Protestant reformers were concerned about. Earlier peoples were trusting that the mystical forces kept some plants “living” when others appeared to have “died,” would protect them from the forces of darkness that prevailed at this time of year. Often the tree would be small and placed on a table, its base encircled by a white fence (known as a Putz fence), behind which might nestle a crèche with a manger scene inside. 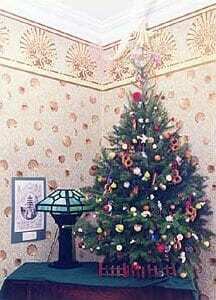 The Christmas tree of the middle Victorian period was, while still small and displayed on a table, somewhat more ornate. Hand-made decorations and blown glass ornaments now graced the branches (which were, incidentally, quite sturdy, since unlike the three-year-old, specially bred, fluffy Christmas trees we favor today, the Victorians preferred tougher seven-year-old trees fresh out of the forest). Candy filled paper cornucopias and decorative little glass cups and saucers that reflected candle and firelight; cleverly folded doilies; dolls (including one dressed as an angel that topped the tree); small toys; tapers either attached directly with wires to the branches or placed in specially designed tin candle holders; crocheted snowflakes; and colorful bits of scrap cloth and ribbon saved up over the course of the year – all of these further enlivened the Christmas tree of the 1860’s and 70’s. These ornaments served not only as decorations but as gifts for family and friends. 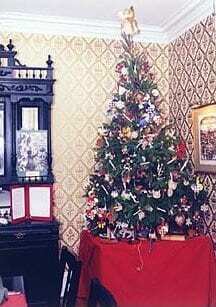 Indeed, shortly after the fully trimmed tree was revealed by the father of the house from behind closed parlor doors (usually on Christmas Eve or the following morning), it was stripped of all its ornaments by the children of the house, much as boys and girls today raid the mantel’s stuffed Christmas stockings. In those days, there were no stockings; to be sure, Christmas gift-giving was conducted on an altogether humbler scale than it is now. The late Victorian Christmas, on the other hand, was a far more elaborate affair, and more like our own. Laden with bright, mass-produced items, the floor-to-ceiling tree bespoke the triumph of the Industrial Revolution, and the manner in which Victorians, at Yuletide, glorified the commodities it had brought their way. For the first time people not only brought tree ornaments in shops, but saved them from year to year. Gifts, too, were store-bought, and far too cumbersome to hang on the tree itself. A simplistic explanation of the Victorian era is that Victorians were flaunting their new-found wealth and technology – in their architecture, their dress and, of course, their Christmas traditions. Once rebuffed critics were now beginning to complain that &Christmas was turning into a festival for shopkeepers! A new form of bah-humbuggery was born. All of these are old customs, out of date, you might say. But things are changing so fast around us that it is nice to take old customs and hang onto them for custom’s sake.” Many who share this passion for the spirit of Christmases past are sure to agree … Finding out more about the customs will prove most inspiring.